The young engineer John Scott Russell first observed the formation of a solitary water wave in a canal in Edinburgh in 1834. He followed it on horseback, and found that it propagated at a constant velocity for miles without changing its form. He even built a water tank in his garden to investigate the phenomenon. But he could not have anticipated the subsequent significance of this 'soliton' waveform for branches of physics beyond the area of fluid dynamics. Today, optical solitons are an indispensable component of laser technology, especially in the investigation of quantum optics and ultrafast dynamics. Physicists at the Laboratory for Attosecond Physics run by the MPQ and LMU have now, for the first time, succeeded in producing temporal optical solitons in a passive free-space resonator. 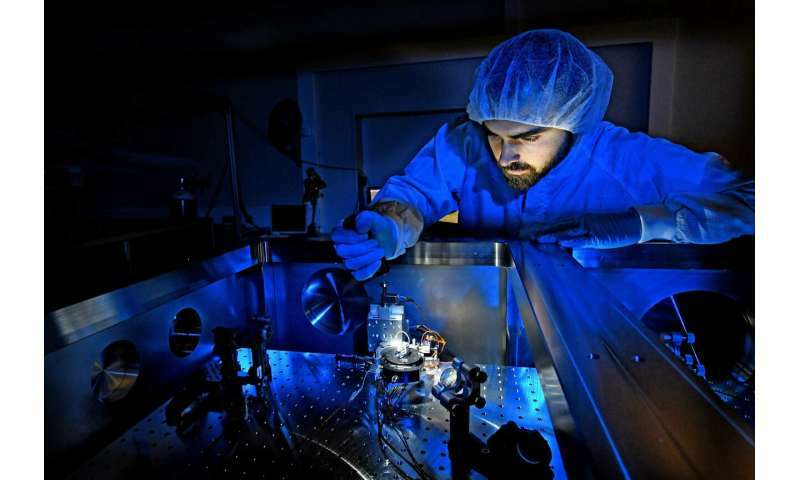 To do so, they coupled 350-femtosecond infrared laser pulses with a wavelength of 1035 nanometers and a repetition rate of 100 MHz, into a newly designed passive optical resonator made up of four mirrors and a thin sapphire plate. "The passage of the electromagnetic field of the optical pulse causes a non-linear change in the refractive index of the crystal," explains Nikolai Lilienfein, first author of the published paper. "This results in a dynamic phase shift, which fully compensates for the dispersion that occurs in the resonator, while at the same time broadening the spectrum of the pulse." Since the power losses that inevitably occur in the resonator are simultaneously compensated for by the interferometrically coupled laser source, a soliton can in principle circulate ad infinitum in the resonator. In addition, the researchers developed a highly efficient method for controlling the energy input to the cavity soliton. In combination, these measures allowed the team to compress the duration of input pulses by almost an order of magnitude to 37 femtoseconds while enhancing their peak power by a factor of 3200. This enhancement-resonator technology opens up new opportunities for the generation of trains of highly precise extreme ultraviolet (XUV) attosecond pulses (an attosecond lasts for a billionth of a billionth of a second). This in turn may enable researchers to characterize the dynamics of subatomic processes – and in particular to observe the motions of electrons – in even greater detail than was possible hitherto. "Over the past several years, we have been able to make the unique advantages of enhancement resonators available for experiments in attosecond physics. This new technique opens a path towards further significant advances in the pulse power and stability attainable with such systems, while at the same time reducing the complexity of the experimental setup," says Dr. Ioachim Pupeza, leader of the group responsible for the new work in the LAP. These improvements would also be of benefit in the context of XUV frequency-comb spectroscopy, which is central to the development of a new generation of optical clocks based on quantum transitions in atomic nuclei.